Wilmington attorney William “Bill” Peelle facilitates the presentation. 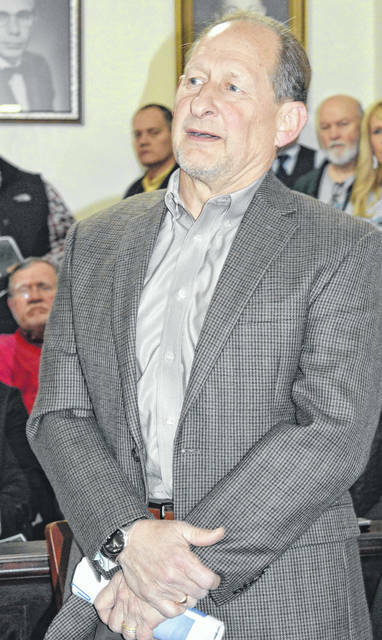 Air Transport Services Group CEO Joe Hete says a Recreation & Wellness Center could help keep local employees from living in neighboring counties, and be regarded as a plus by Amazon. In the foreground from left, Clinton County Commissioner Kerry Steed talks with Williams Architects/Aquatics Vice President Tom C. Poulos. 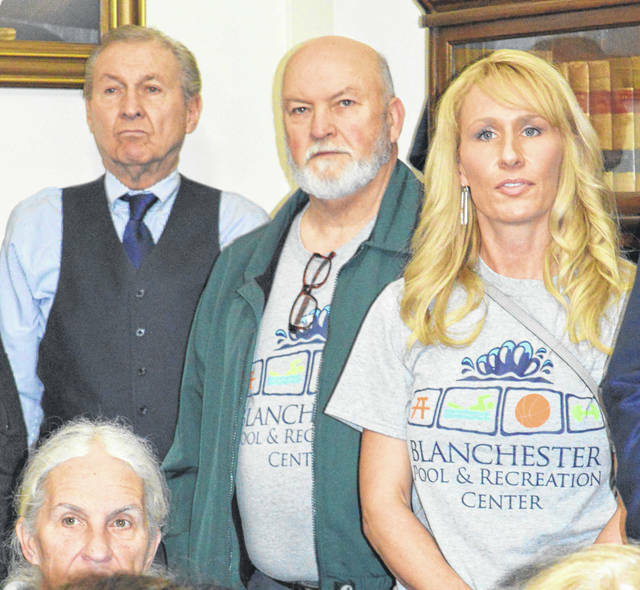 At right, Erin Whitaker is invited to speak Monday about a proposed Blanchester Pool & Recreation Center project. This depiction is a “conceptual visual” of a proposed Recreation & Wellness Center on Wilmington’s west side. 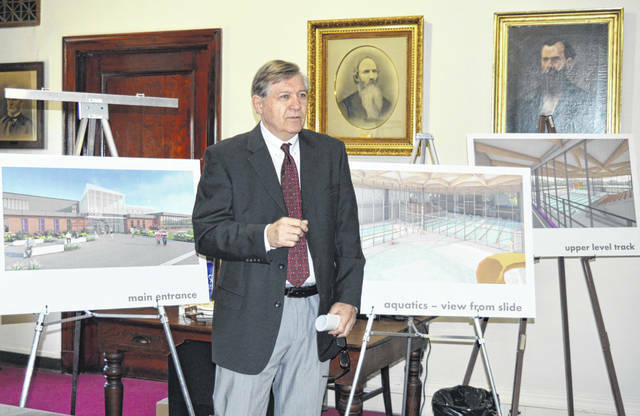 WILMINGTON — A feasibility study that explored the potential of a Recreation & Wellness Center in Wilmington was presented to the county commissioners Monday, drawing a roomful of supporters for the prospect. Presentation highlights included a ranking of facility features based on an online community survey of 833 respondents; a list of funding options; and feedback from interviews with community stakeholders who see “a clear need” for an indoor facility. The survey reflects that top-ranking amenities the respondents want include an indoor walking and running track; indoor pools for lap swimming and competitive swimming and water aerobics; a group fitness studio; a fitness center (free weights, weight machines, and elliptical); an indoor warm water therapeutic pool; a gymnasium and indoor basketball and volleyball courts; and indoor water play features and a zero-depth entry pool. Key takeaways from the stakeholder interviews include the facility must have multi-generational appeal with emphasis on youth and seniors and people with disabilities; the facility must be priced to be affordable for low-income households; it needs to aim at filling gaps and not compete with existing private facilities; and facilities must serve all Clinton County. The feasibility study includes an estimated construction cost of $24.6 million. There were basic floor-plan sketches depicted, as well as conceptual visuals of the facility’s exterior. The site, located northwest of Wilmington High School, would be donated by landowners Larry II and Terri Roberts. They also have agreed to assist with some of the infrastructure, said local attorney William “Bill” Peelle, who facilitated the presentation. Peelle asked that one commissioner become a member of the steering committee. Attorney Chaley Peelle-Griffith, who also has been working on the possible project, said after the meeting that having a commissioner will be an integral part of the committee’s work while it comes up with plans for financing, ownership and management. Peelle-Griffith said supporters want commissioners to be “on board” with the plans and suggestions that the steering committee draw up. She anticipates the committee getting back with commissioners about the facility and funding alternatives in early June. Bill Peelle started his opening remarks by noting there currently are two proposed health and wellness projects “that have growing support in our county.” The other one, as previously reported in the News Journal, is a Blanchester Pool & Recreation Center project. Peelle said in his opinion both projects can be successful, and he said supporters of the two projects can rally around one another. 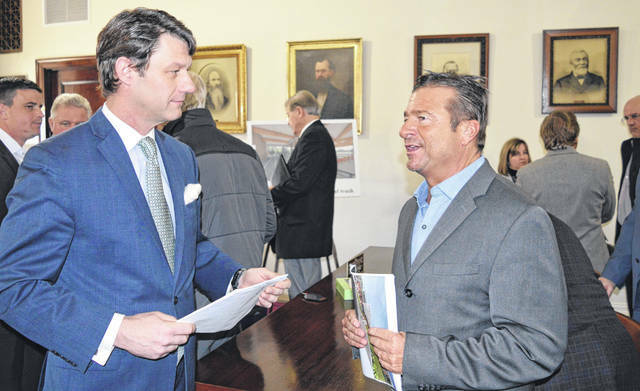 The feasibility study for the Wilmington project was developed by PROS Consulting, based in Indianapolis, Indiana, and the Clinton County Regional Planning Commission (CCRPC). CCRPC Executive Director Taylor Stuckert on Monday underscored what Peelle had said earlier about prior initiatives — Clinton Memorial Hospital nearly 70 years ago and the 100-year-old Clinton County Courthouse — having been led by boards of county commissioners. PROS Consulting President Leon Younger said there is as much support from local seniors for a Recreation & Wellness Center in Wilmington as any other age bracket. The proposed facility size is listed at 50,500 square feet. Younger gave an estimated annual cost of $1.8 million to operate the center. A pro-forma revenues and expenditures chart was included in the presentation handout. Several attendees spoke in favor of a Recreation & Wellness Center in Wilmington. They included a local realtor, the CEO of Air Transport Services Group (ATSG), the president of Wilmington College, the superintendent of Wilmington City Schools, the executive director of Ohio Living Cape May, the head of Wilmington Parks & Rec, the city service director, and an advocate for the local Hot Hoops program.